Chicago — Potter & Potter Auctions is pleased to announce its 750 lot Vintage Travel Poster Sale to be held on Saturday, December 1, 2018 starting at 10am at the company's gallery, located at 3759 N. Ravenswood Ave., Chicago, IL 60613. All lots from this upcoming sale from are on display and available for public preview on Wednesday, November 28th, Thursday, November 29th, and Friday, November 30th from 10:00am to 5:00pm in the Potter & Potter facility. This travel poster event offers a grand tour of European cities, with two examples taking top spots in the sale. Lot #166, a 1951 Venezia poster by Frenchman Adolphe Mouron (1901-1968) features a tranquil vista on a Venetian canal with a man in renaissance dress operating a gondola whose image is inversely reflected in the water. It was printed in Milan by Calcografia & Cartevalori and is estimated at $2,000-3,000. And lot #355, a c. 1935 Swedish American Line poster, is illustrated with an imposing ocean liner, likely the MS Kungsholm. This impressive, Art Deco style example is estimated at $2,000-3,000 and was printed by the Swedish firm Icasons. Other European destinations are also well represented in this sale. 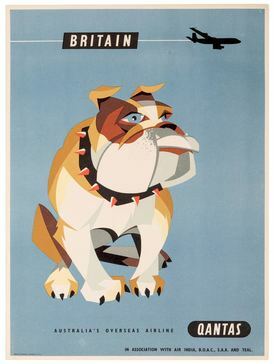 A top dog here is lot #80, a British travel poster featuring an English bulldog on a blue background with a jet above. This c. 1960 poster for Qantas was designed by Australian Harry Rogers (1929-2012.) Lot #309, a Berliner Allee cityscape of Dusseldorf, Germany from the perspective of a table on a patio, is a breath of fresh air indeed. It was designed by H. Gutschow in 1955. And lot #290, an Air France color lithograph with vignettes of various sites, landmarks, and characters of Europe, was designed in 1960 by Frenchman Jean Carlu (1900—1997.) All three are conservatively estimated at $250-350 each. It is possible to go great distances without leaving home via the marvelous Russian and Far East posters available through this event. Bidder battles are certain to break out over lot #214, a 1939 Georgian Military Highway poster by Russian artist Alexander Zhitomirsky (1907-1993.) This stunning example, published in the USSR by Intourist, pictures a blue sedan racing through the mountains on the highway and is estimated at $1,500-2,500. It's also back to the USSR with lot #431, a Pan Am poster vividly illustrated with the St. Petersburg Church of the Savior Blood turrets. This example is from 1970 and is estimated at $500-700. And lot #298, a Discover Japan Fly JAL 1950s-era color lithograph of a kite in the form of a samurai on a teal background is certain to take flight, given its charming and period presentation. It is estimated at $250-350. Posters representing southern destinations lend a touch of southern comfort (and hospitality) to this auction. Lot #288, a c. 1955 poster from the Mexican National Tourism Council, is illustrated with a photograph of a large Mexican fruit display complete with a man and woman topper in traditional dress. This "Paradise of Tropical Fruits" is estimated at $150-250. It's impossible not to make eye contact with Lot #300, a Pan American poster for Tahiti featuring a beautiful woman with a suggestive gaze. This looker from the 1970s is estimated at $300-500. And lot #540, a c. 1950 Habana, Cuba poster from Artes Graficas promotes the city's twinkling lights, landmark buildings, and main thoroughfares. It is estimated at $1,400-1,600. This sale comes rounds out with can't look away selections of posters featuring sports, events, adventure, and other exotic destination themes. Lot #236, a rare and original 1946 Air France travel poster for West Africa by Vincent Guerra is estimated at $1,500-2,000. It comes to life with an abstracted, patterned image of African elephants among their native terrain, with a jet flying overhead. You can go anywhere with lot #152, a classic modernist travel poster from American Airlines advertising the concept of travel rather than a specific destination. This inspiring example was designed by Edward Mcknight Kauffer in 1948 and is estimated at $1,500-2,000. And last to take a pole position in this summary is lot #102, a Dorothy Waugh (1896-1996) poster promoting winter sports for the US Parks Service. This Art Deco style piece, showing a pair of skiers silhouetted in snowy white against a blue and green background, is estimated at $1,400-2,000. According to Gabe Fajuri, President at Potter & Potter Auctions, "We're pleased to offer such a diverse selection of posters, in such wonderful condition, and all from a single owner collection. Any enthusiast with an interest in modern master poster designers should find something appealing at this sales event. These striking images should also catch the eye of designers, decorators, and anyone looking for first-class examples of mid-century modern decorative art." Potter & Potter, founded in 2007, is a Chicago area auction house specializing in paper Americana, vintage advertising, rare books, playing cards, gambling memorabilia, posters, fine prints, vintage toys, and magicana - antiques and collectibles related to magic and magicians. The company's next sale, an online only Winter Magic Auction, will be held on December 15, 2018. The auction will be conducted exclusively on Potter & Potter's online bidding platform. The online catalog will be posted approximately two weeks before the date of the sale. For more information, please see www.potterauctions.com. Follow us on Facebook (potterandpotterauctions), Twitter (PnPAuctions), and Instagram (potterauctions).